Coach Jatin Patel with members of the Bulls team. University of South Florida, Tampa Florida: The Bulls cricket team represents the University of South Florida (USF) at women’s cricket. Established in 2015, the USF Bulls – Women’s cricket team is known to be the first and only college/university full-time undergraduate or graduate students’ women’s cricket team. The team initially got some hands-on training from the USF men’s team at the same campus, and from there they built a competitive team and have played a few games every year since 2015. 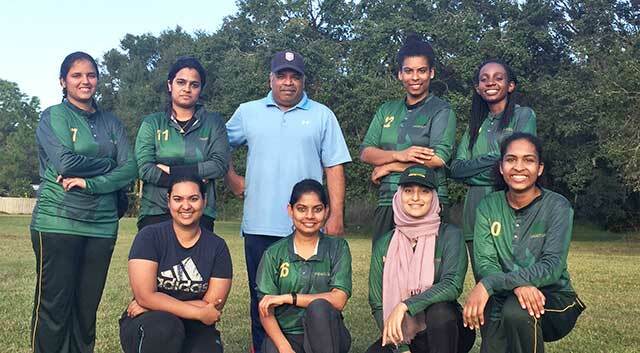 The Current USF Women’s cricket team started with Ankita Ajith Deshpande, Delisa Harry, and Vasudha Prithipaul – who came together to form a women’s cricket team on the USF campus with the support of Roshni Chasmawala and the USF cricket club. Currently the women’s team boasts true diversity with ladies from seven nations – Guyana, India, Nigeria, Mauritius, Egypt, Ecuador, and Italy. Ankita Ajith, the captain is the most experienced player and has been playing cricket for six years, including captaining the U-19 State-level cricket team in India to victory in two matches at the State level. Ankita loves cricket and is pursuing a desire to play for the USA Women’s cricket team. USF Women’s Cricket Vision – aims to promote cricket among the student population on the college campus. 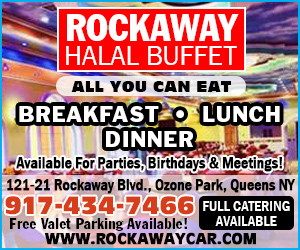 They are striving to develop a team of multi-ethnic, multi-racial women from all backgrounds and walks of life. In the long run, they hope to create long lasting friendships within the growing community of women that transcends their time at the university. USF women’s cricket is growing and the plan is to participate in as many matches and tournaments in the future as possible, as the ladies develop their competitive game spirit and related skills. 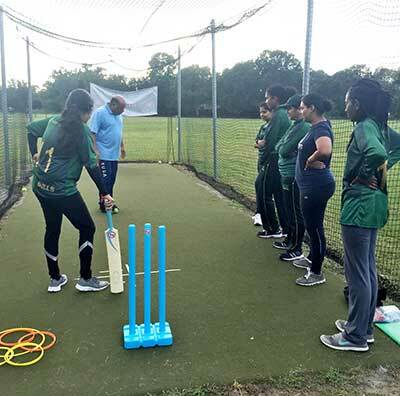 USF Women Cricket Club is highly appreciative of the opportunities for professional cricket training to develop the skills needed to play at the highest levels of the sport. They would love to have Jatin Patel, a recognized American Cricket Federation (ACF) cricket coach, back to coach and take them to another level. The USF women’s cricket team members Alby Babu, Ankita Deshpande, Farida Eid, De Sica Harry, Delisa Harry, Ufuoma Ikoba, Divya Patel, Vasudha Prithipaul, all gained Level 1 cricket coach training certification during a recent team coaching/coach certification camp led by Jatin Patel, Director of Coaching for American Cricket Federation (ACF). The USF certified Level 1 cricket coaches immediately got an opportunity to work with school kids at a Youth Cricket Camp hosted by the Tampa Cricket League. A unique women-only cricket training and coaching camp sponsored by the ACF was held during the Finals of the inaugural USF Bulls T20 Inter-college/university championship. Six universities participated in the training camp. It’s just amazing that the USF women’s team is truly a universal team with the diversity as players from different parts of the world, including a few non-cricket playing countries, all working together to become a very competitive team through regular practice and training. One of the many net session. “Thank you, Mr. Jatin Patel, for taking the time to do this! Great initiative by USF Cricket Club to coach and develop our women’s cricket team at the Cricket Coaching Camp today! We appreciate your efforts, expertise, and your commitment to develop and expand women’s cricket in the USA! It was a great opportunity to have coaching from Jatin Patel for our women’s cricket team where he executed basic cricket drills which were effective and useful for the entire team. I would like to thank Jatin Patel for sharing his knowledge about the game. We had a very productive time during the training with Coach Patel.” – Ankita Deshpande, Captain USF women’s cricket. The ACF Coach Certification Program is now established in 24 States, with Level 2 and Level 1 coaches, as well as Level 1 Instructors. The program was launched in May 2014 for Level 1 coaches and June 2015 for Level 2 coaches. As of November 21, 2018, there were 172 Level 2 coaches and 342 Level 1 coach trained and certified through ACF Coach Certification programs. The numbers exclude – School Physical Education teachers and future coaches at the six colleges and universities.